I think you're right, Leni, it does have a leaf, and on closer inspection, I think it used to have two. (I've just found more damage that was hiding).I also think it used to have 3 leafy feet, but it only has 2 now. It has been a bit polished, and there's a big crack in the base. It still displays very well. I'd agree with you that on these, a bit of damage is not really a problem. The multi-branch pieces are stunning. 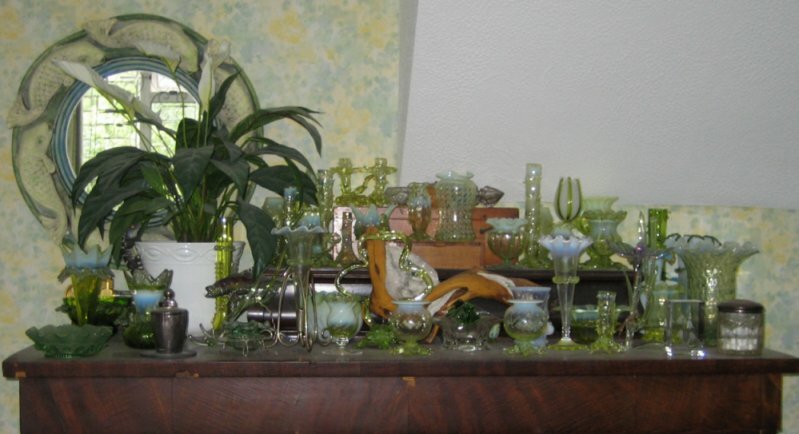 I love this kind of glass, in any colour. There's definitely a market for this glass, & it rocks my world far more than any modern stuff. Paul, your vase is really beautiful. I must warn you that one day you'll realise your house is full of this glass! It's addictive-either that or it breeds! Marinka says:- ".....or it breeds" - I WISH! A really fabulous collection. Dare I ask....are you able to dust? I wouldn't bother if it was me LOL. Dusting is something I don't have to do too often as most of my glass is in cabinets. But when I do have to dust I use artist's brushes. Soft hair ones like watercolour brushes. Excellent & also gentle on delicate Victorian confections of thorns & flowers! 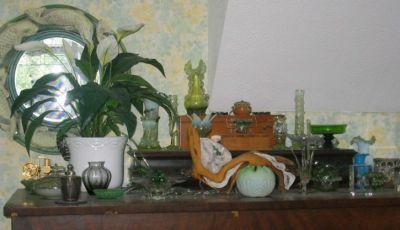 A cabinet will be a good investment for your beautiful green glass collection- no more dusting, safety from damage,etc.